To create a super cop we must look to training and the skill developmental of the human brain. After returning from a counter terrorism training mission in Israel in 2006, I was convinced that American law enforcement needed to change the way we are training our officers to meet the needs of today’s challenges of terrorism, gang warfare, narco -trafficing and sophisticated criminal activity. We need to increase critical thinking skill development and observational skills if we are to be successful in protecting our Nation and modern society. I began looking at master performers from at different disciplines to determine how they have improved their skills. Journalist, Malcolm Gladwell in his book Outliers also studied people with exceptional capabilities, everything from athletes, musicians, marksmen etc. The common thread he found in any that were considered “World Class” is that they spent an enormous amount of time with focused practice and training developing their skills and abilities. I thought of those in our military and specialized law enforcement units, Navy Seals, Army Rangers, Delta Force, SWAT and other highly skilled operators. Although, the individuals that are selected for these units are highly vetted, it is their continual training, skill development , and most importantly tenacity, that make them almost super human. So I wondered how we could expedite the skill development curve that would be practical for a law enforcement officer that has an extremely limited amount of time to train and cannot or maybe better stated will not devote the incredible time necessary to perfect skills. As an overall strategy, I used Col. John Boyd’s O.O.D.A. Loop (Observe, Orient, Decide, Act). See chart below. When we look at Boyd’s theory we find that Observation is the first component in the loop. We can not expect to get good results in the other phases of the loop, if we are not accurate and rapid with what we observe in circumstances that are as dynamic and rapidly changing as the situations being faced today on the street. 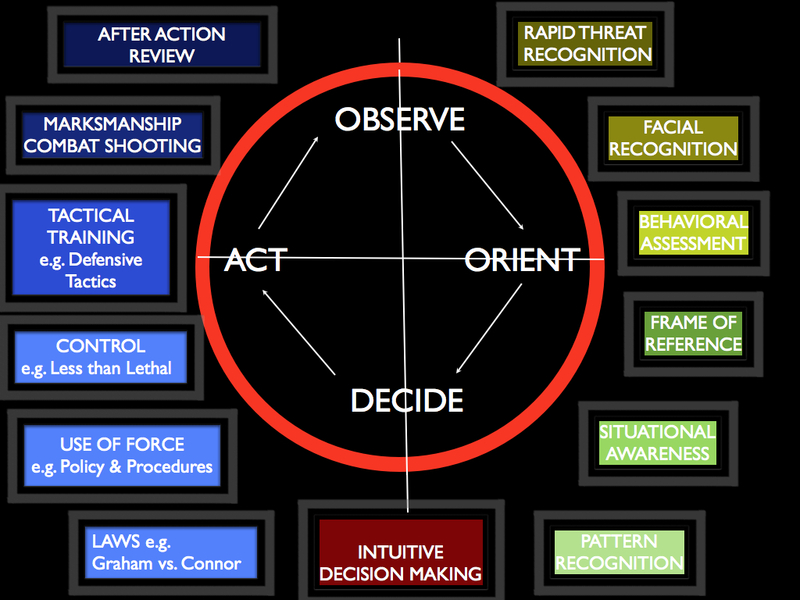 As I dissected the OODA Loop I began to notice that law enforcement has spent the majority of the time training on the (Decide - Act) piece of the Loop and has spent little if any skill development on (Observe - Orient). When looking at observation from a law enforcement training perspective, I tried to find if there was training to increase observation skills. My research concluded that there has been little, if any training for this mission critical and highly important skill that every officer must possess to be effective and safe. Generally the only observational training an officer may encounter is the old exercise of having an unknown person run into a classroom, create a disturbance and then have the officers erroneously describe what they saw. This exercise generally accomplishes two things. It shows the unreliability of an untrained eyewitness and proves that a police officer’s observation skills are not any better than the lay person. The reason this is so important is that approximately 80% of what we perceive is delivered by our eyes to the visual cortex in our brain. We see with our eyes, but it is the brain that interrupts the signals we receive. Therefore, we need to train our brains to see accurately, rapidly and interpret visual signals correctly. My friend, Derek Bartlett, (Sniper Craft) presents a fantastic class where he demonstrates perceptual blindness which will convince you that you do not see as accurately as you think you see. Brain plasticity or neuro plasticity are terms that are quite foreign to the law enforcement vocabulary. In fact, these terms are foreign to most people. However, in the near future these terms will become as common as the personal computer, IPOD, IPAD, Android, GPS and myriad of technological devices because brain training is going to be the next big thing. So listen up. Brain Plasticity is a term that was first coined by Dr. Michael Merzenich, professor emeritus of University of California San Francisco. He is one of the world’s preeminent brain and neuro scientist. What Dr. Merzenich has scientifically proven has shocked the scientific community by proving that the human brain constantly changes itself and can do so until death. Although that may not sound like a dramatic discovery, what he has proven completely shocked the scientific community and shifts a paradigm of what was previously believed about the brain. Why this discovery is so important is that until the past several years it was believed that the brain you were born with developed and then gradually deteriorated with age. Although, there is definitely degeneration of the entire human body, including the brain as we age, the good news is through mental exercises we can continue learning and increasing our brain functionality until the day we die. In fact, the brain continually and dynamically changes throughout our lives. Not only that, this research proves that we can begin to utilize some of the brain’s tremendous untapped potential. Almost a year ago, I was fortunate and privileged to meet Dr. Merzenich, after I emailed him and requested his help in training law enforcement officers. I presented a copy of the Rapid Threat Recognition DVD program. When he looked at the program I created he said, “Some how you intuitively came up with a brain plasticity program that I have spent the past 40 years researching. You are right on target.” Now let me explain to you scientifically how all this works. I then asked him, Can we create super cops using brain plasticity? His answer “YES YOU CAN! The sky is the limit!” The only caveat to this is that it will require focused training to do so. How would you like your favorite football, baseball, basketball, or hockey team only going to a lecture on diversity or sexual harassment and neglect any practice on the field before the next game. I know theses game are far more important than the life and death situations police officers may find themselves in…REALLY??? Pardon my factious amygdala for over reacting (for those who don’t know, the amygdala is an older part of the brain responsible for emotion.) Where are our priorities? We spend hundreds of millions of dollars training athletes, as well as compensating them, but our police officers who are responsible for defending our liberties, and keeping our communities safe often get less training than a hair dresser, nor do they get anywhere near the practice to develop the skill sets necessary to keep them street ready. Qualifying on the range a few times a year…Please! Today we need every advantage we can muster to outpace our adversaries and stay safe. Brain plasticity training is going to be the future of law enforcement. We need to switch the paradigm now from “We’ve always done it this way” and begin looking at new training methodologies. Ask yourself, “If you knew that tomorrow you were going to be in the fight for your life, How would you train today? YES YOU CAN BECOME A SUPER COP! It just requires habitual training, commitment and tenacity.